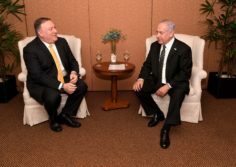 The discussions between Pompeo and Israel are expected to also include Iran and “Iranian proxies,” according to a senior US State Department official, who spoke to reporters on background that was published in a press release by the State Department. Hezbollah is the primary Iranian proxy, and not surprisingly, a key topic for Pompeo when he visits Lebanon—the homebase for the terror group. Perhaps more surprisingly, the topics of natural resources in the region and Hezbollah are linked. Iran’s PressTV reported last month that Lebanese Parliament Speaker Nabih Berri was upset while claiming Israel was working with a company to “exploit” a maritime reserve for gas and possibly oil next to—but not technically in—Lebanese sovereign waters. Per a past report from PressTV, the two sides have disputed ownership over some of the reserves in the region, and the unnamed senior State Department official appeared to allude on Friday to the regional cooperation that Lebanon is missing due to the failure to reach an agreement with Israel. Ultimately, Lebanon is just hurting themselves, and Hezbollah is part of that problem. “The rest of the Eastern Med is moving forward in exploring and exploiting for the benefit of their people—Greece, Cyprus, Turkey, Egypt, Israel—those resources. It would be regrettable if the people of Lebanon were denied, as a result of Hezbollah and others, their ability to join in this as well,” said the official. Commenting on Pompeo’s upcoming visit to the Middle East, the senior State Department official said the US remained ready “to facilitate discussions” between Lebanon and Israel regarding the dispute for potential offshore natural resources. The Iranian terror proxy’s negative impact goes much further than just harming natural resource cooperation, however. Pompeo, according to the US official, is expected to discuss with senior Lebanese officials, “the need for Lebanon to be able to move forward in prosperity, peace, lasting security, as a nation capable of taking independent decisions on behalf of the people of Lebanon.